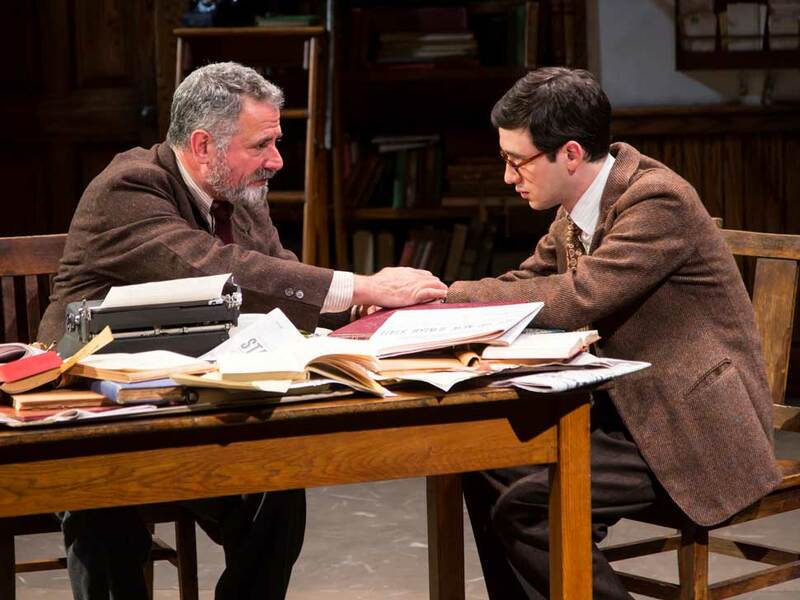 It had been too long since I’d seen a show at the Long Wharf, so when Chaim Potok’s The Chosen was announced I got tickets. I remember reading this coming-of-age tale in high school, examining the relationship between a pair of fathers and sons during World War II, but my memory of the plot was dim and I was looking forward to the stage version. First, let me say, if it’s been a while since you’ve been to Long Wharf, it’s a lovely venue, with comfy seating, and not a bad one in the house. The theater is a half-round, with the action taking place on stage below instead of above you. These days it’s hard for me to quiet my over-stimulated brain long enough for a two-hour play, but I had no trouble here. The fathers, so well acted by George Guidall and Steven Skybell, are Jewish, but from two radically different sects. The growing friendship between the sons forces an unlikely relationship between the families, who, though Jewish, hold conflicting beliefs. The fathers attempt to accept the paths their sons have chosen, forging a bridge between the families. It’s a story about love, relationships, compassion, and tolerance that is perhaps more relevant today than when it was originally published in 1967.